Some public demonstration was talked of, in which the mayor and members of the common council and other city officials of Portland, should unite with the officers of the municipal government of East Portland; that there would be a procession, music and congratulatory speeches made, and that the event would partake somewhat of the nature of a gala-day. However, as the project did not seem to meet with a very responsive spirit, the matter went by default and it was concluded to quietly open the bridge without any public demonstration. The full length of the $200,000 bridge was 1650 feet, from the east line of Front street to the west line of Water street, with an 808 foot long iron draw. The movable span, which required about 90 seconds to open and close, was 26 feet high and 40 feet long. The roadway was 25 feet wide with 5 foot wide sidewalks on either side (sorry, no bike lanes). The toll rates were $.05 cents for pedestrians (but you could get 8 tickets for $.25! ), $.10 for horsemen, and anywhere from $.15-$.25 for vehicles with sundry additional charges depending on load size and passenger count (Morning Oregonian, 04-07-1887). 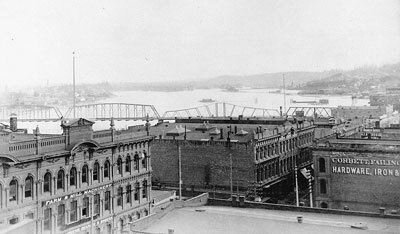 Built by the Willamette Iron Bridge Company, when it opened the Morrison street bridge was the largest span west of the Mississippi (Insiders’ Guide to Portland, Oregon, page 12). Morrison Bridge #1 was replaced with Morrison Bridge #2 in 1905, and #3, the Morrison Bridge we know today, was opened in 1958.